Lovely 2 Bedroom cottage nestled in vacation community with private beach. 5 minute walk to the beach. Enjoy a bit of paradise in newly renovated sun-lit 2 bedroom cottage, with dishwasher, bathroom, great sun exposure, sunny front deck, shaded back area. Our family purchased this place after staying with friends and we loved the ambiance of this area. We both grew up on Long Island and look forward to your enjoyment of this wonderful community. We love the unique feeling that this neighborhood has. We enjoy the wonderful beach and terrain, which creates a beautiful and visually lasting impression every time we stay. 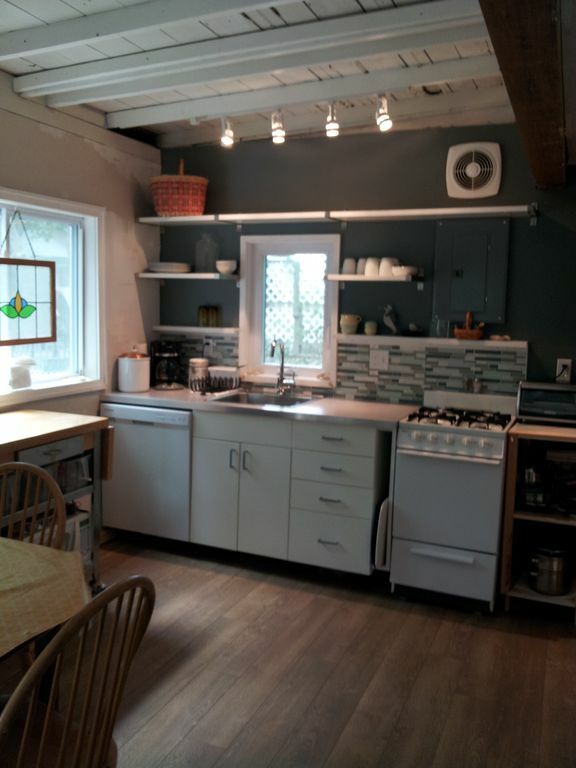 We love Sunnyside cottage because of it's proximity to the water and the North Fork. This home is in a quiet community, with sun most of the day, and surrounded by trees. Located up on the cliff area of the Long Island Sound..
Air conditioner is located above window on wall. Need to use a step stool to turn on and off. Driveway accommodates smaller cars. Very large vehicles can park around the corner.. Living area part of the dining and kitchen as one "L" shaped space.